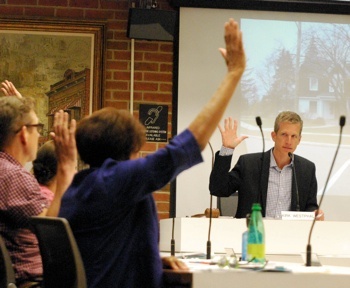 Ann Arbor planning commission meeting (June 17, 2014): On a 7-1 vote, the Ann Arbor planning commission cleared the way for a group of up to six members of the Ann Arbor Jesuit Community to live in a single-family home at 1919 Wayne St. The action came at the commission’s June 17 meeting, when commissioners reconsidered an item that they had initially rejected on June 3, 2014. The meeting included a public hearing that lasted about an hour, with the majority of the 23 speakers supporting the request. More than 100 people attended the meeting, many of them wearing stickers that stated “I Proudly Support The Jesuits.” The Jesuits who would be living in the house are affiliated with the St. Mary Student Parish. Approval requires six votes, but on June 3 the request had garnered support from only five of the seven commissioners who were present. 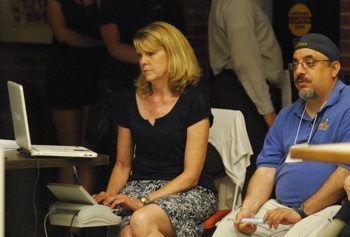 Voting against it on June 3 were Diane Giannola and Kirk Westphal. Two commissioners – Sabra Briere and Paras Parekh – had been absent. Later in that June 3 meeting, commissioners voted to reconsider the item, then postponed it until June 17, when more commissioners would be present. 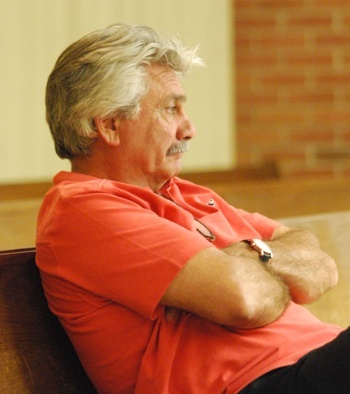 Giannola again dissented on June 17 to the special exception use, but the remaining seven commissioners at the meeting – including Westphal – supported the request. Jeremy Peters was absent. 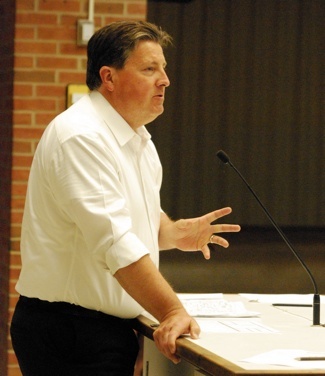 Assistant city attorney Kevin McDonald attended the June 17 meeting and fielded questions from commissioners. The motion was amended slightly, with an intent to emphasize the long-term relationship of the Jesuits to each other. The property is located in Ward 2. 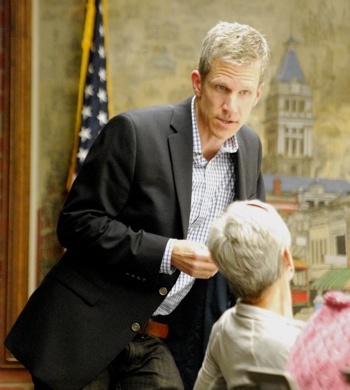 Both of the Ward 2 city councilmembers – Jane Lumm and Sally Petersen– attended the June 17 the planning commission meeting, but did not formally address the commission. The planning commission’s decision is final – as the request from the Jesuits does not need city council approval. Westphal – the planning commission’s chair – is running for city council in the Ward 2 Democratic primary. Westphal and Nancy Kaplan are vying to fill the open seat that’s being left by Sally Petersen’s mayoral candidacy. Councilmember Sabra Briere, who serves on the planning commission, is also running for mayor. 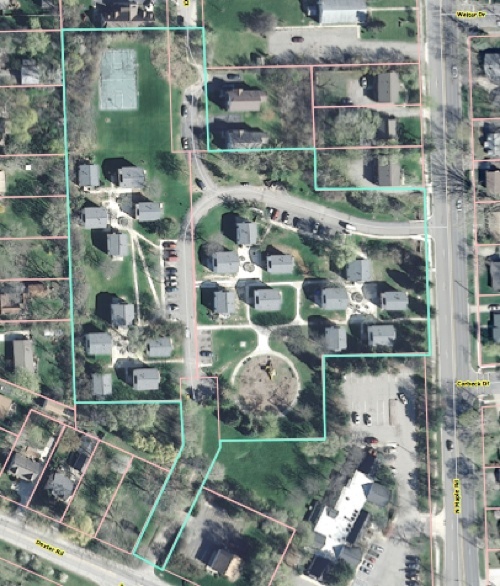 Commissioners also acted on another item they’d postponed from June 3: A proposal by the Ann Arbor housing commission to expand low-income housing on North Maple Road. The commission recommended rezoning a 4.8-acre site at 701 N. Maple Road from R1C (single-family dwelling district) to R4B (multi-family dwelling district). They also recommended approval of a site plan and development agreement for the project – part of a major renovation effort by the Ann Arbor housing commission. The site is on the west side of North Maple, between Dexter Avenue and Hollywood Drive. The project calls for demolishing 20 existing single-family homes – the public housing complex known as North Maple Estates – and constructing an eight-building, 42-unit apartment complex with a total of 138 bedrooms. The units range in size from one bedroom to five bedrooms. 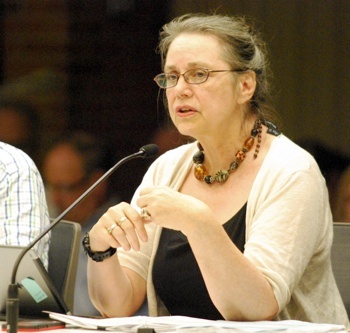 Five people spoke during a public hearing on the item, including Gwenyth Hayes, the resident representative on the Ann Arbor housing commission. “A lot of times in Ann Arbor we talk about diversity. 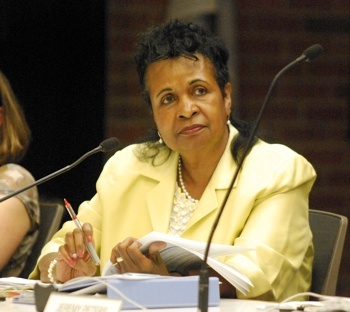 It’s important that we also include not just cultural diversity, but also socio-economic diversity,” Hayes said. That’s why the city needs more affordable housing, she added. 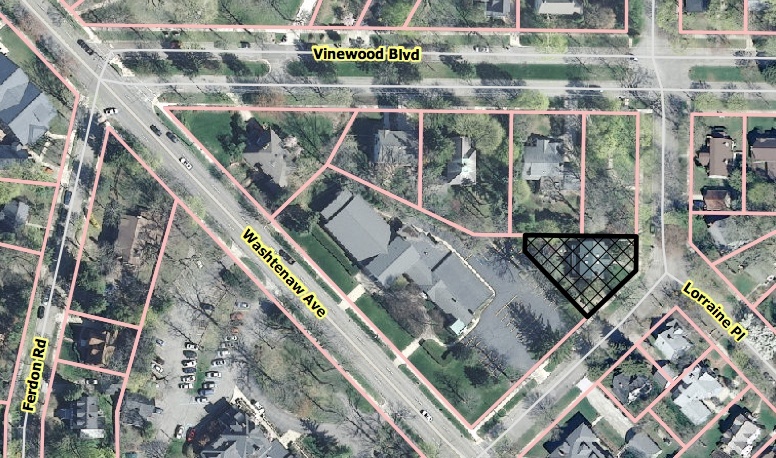 Another residential housing proposal – a $10 million, 78-unit apartments complex called State Street Village, across from the University of Michigan athletic campus – received criticism from some commissioners, but ultimately was recommended for approval. Commissioners spent about 30 minutes asking question and pressing the developer, McKinley Inc., to go beyond what the city code requires in terms of design, pedestrian amenities, a reduction of impervious surfaces, and stormwater management. “We’re putting our aspirations on you,” Bonnie Bona told them. The vote, which came near midnight, was unanimous – with only six of nine commissioners present. Also recommended for approval was a proposal for a new drive-thru restaurant on Jackson Avenue near the I-94 interchange, next to Westgate Shopping Center. The plan calls for demolishing the existing one-story service station and auto repair shop and constructing a single building with a drive-thru restaurant and adjacent retail store. The Ann Arbor Jesuit Community, formally known as the USA Midwest Province of the Society of Jesus, had requested a special exception use to allow a “functional family” to live in a house zoned R1C (single-family dwelling). Without the special exception use, only up to four unrelated people could live there. The request was first considered at the planning commission’s June 3, 2014 meeting. Aerial view of 1919 Wayne St.
Approval requires six votes, but on June 3 the request had garnered support from only five of the seven commissioners who were present. Voting against it were Diane Giannola and Kirk Westphal. 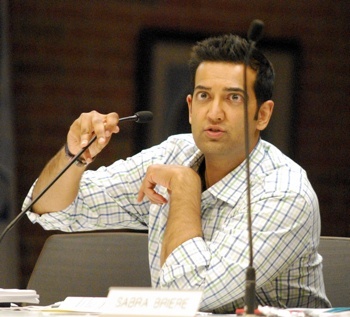 Two commissioners – Sabra Briere and Paras Parekh – had been absent. An attempt earlier in that meeting to postpone the vote had failed, with a majority of commissioners wanting to take action that night, apparently assuming it would pass. Later in that June 3 meeting, after the item had been rejected then reconsidered, the commission took another vote to postpone. That vote was 6-1, over dissent from Giannola. Ben Hawley, pastor and director of campus ministry for the St. Mary Student Parish. The planning commission has discretion to grant a special exception use, which does not require additional city council approval. The code that allows this special exception use was adopted in 1991. Before that time, most communities didn’t provide for an alternative family living arrangement in their zoning codes. In 1984, the Michigan Supreme Court determined that some provision for a living arrangement other than a traditional biological family was needed. That ruling came in the case of Delta Charter Township v. Dinolfo. A “functional family,” for purposes of the city’s zoning code, is defined as follows: “a group of people plus their offspring, having a relationship which is functionally equivalent to a family. The relationship must be of a permanent and distinct character with a demonstrable and recognizable bond characteristic of a cohesive unit.” The staff reports states that a functional family is not a social society, club, fraternity or sorority, association, lodge, organization, group of students or other unrelated persons living together temporarily. 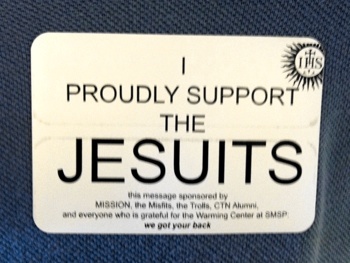 Stickers were passed out at the June 17 planning commission meeting by supporters of the Jesuits. The permit must apply only to the functional family “type” that obtains the permit – in this case, the Ann Arbor Jesuit Community. It is limited to the number of people specified in the permit, and there must be a contact person identified as head of household. This special exception use would be limited to up to six people, with Rev. Dan Reim acting as head of household. Although the city’s ordinance has allowed for a “functional family” designation since 1991, this is the first time any group has requested it. The residents would be members of the religious order at St. Mary’s Student Parish, or pursuing degrees at the University of Michigan or other local institutions. As a functional family, we refer to one another, when speaking of each other collectively, as “brothers.” Our unity is based upon our religious commitment to live together as a religious family. As brothers related to one another by our common vows and commitment to service in the Church, we are, like a family, one another’s primary support system. The basis of our living as a household is not temporary or dependent on the University school year or any such seasonal arrangement or pattern, as a fraternity or sorority would typically be. Jesuits living in structured households under a superior has been an integral part of the religious order for centuries, and the Jesuits who will live at 1919 Wayne will be participating in that centuries old tradition. In addition to meeting the “functional family” requirement, this special exception use must meet with certain standards, including compatibility with the zoning district and adjacent districts. The use must also not generate an intensity that would be hazardous or inconvenient to the neighborhood, or conflict with normal traffic. 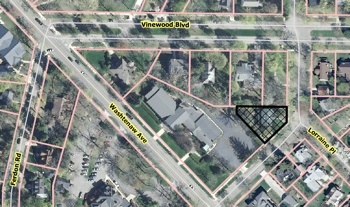 Wayne Street is located on the city’s near east side, between Washtenaw Avenue and Vinewood Boulevard, in Ward 2. No exterior changes are planned to the structure of the house, which has about 4,000 square feet with seven bedrooms and two bathrooms. The Jesuits indicated that they’d like to reconfigure the interior to use one of the bedrooms as a guest room and to add two bathrooms. The special exception use would be contingent on providing off-street parking spaces for each vehicle used by the residents. There are two spaces in the garage and two tandem parking spaces in the driveway. They also have received permission to park two vehicles at the lot for the First Church of Christ, Scientist, which is adjacent to the site. DiLeo pointed out that enforcement of SEU conditions is complaint-driven – the city relies on its citizens to notify staff if there is a violation of any ordinance, she noted. All SEUs must be activated within after ? ?three years of approval. So for this SEU, the Jesuits must move into 1919 Wayne by June 17, 2017. There are several things that would cause a SEU to lapse or be revoked, including violations of the conditions or vacating the property for 24 months. In other types of special exception uses – like a child care center or fraternity – the original entity could move out, but a similar entity would retain the SEU, because it “runs with the land.” For a functional family, however, the SEU is not transferable to a different group, DiLeo explained. In response to requests from commissioners on June 3, the planning staff had subsequently surveyed some communities in Michigan and out of state. The staff in other cities could not recall if their functional family provisions had ever been used or had said it was used very rarely, DiLeo said. DiLeo concluded by saying that the staff recommendations from June 3 remain unchanged, and they continued to recommend approval of the request. Some people on June 3 directed criticism against the power, privilege and abuse of the Catholic church. Other praised the Jesuits, saying their concerns were strictly related to the zoning code, which they didn’t feel permitted this type of living arrangement in the R1C district. They suggested that the Jesuits could live in other districts – like R4C – that would allow for up to six unrelated people to live together without getting a special exception use. Dan Reim would be head of household for the Jesuits at 1919 Wayne St.
On June 17, another public hearing on this item drew considerably more supporters of the request. The commission had also received 81 emails/letters in the two intervening weeks, the vast majority of them in support of granting the special exception use. Those communications are attached to the commission’s online agenda. Planning chair Kirk Westphal began the public hearing on June 17 with some reminders, noting that commissioners “are all mortals up here, and at a certain time, people lose their ability to sit in a meeting.” He asked speakers to queue up, talk into the microphone, and address the commission – not others in the audience. He noted that commissioners would be looking at the city code requirements, consistency with the city master plan, and impact on the neighborhood. Because it was a new public hearing – not a continuation – speakers who weighed in on June 3 could speak again. But Westphal encouraged them to let new speakers go first. He described the strategy of having others in the audience stand up if they supported the speaker’s opinion, and stressed that although speakers had 3 minutes each, they didn’t need to use the entire time – a comment that drew laughs from the crowd. 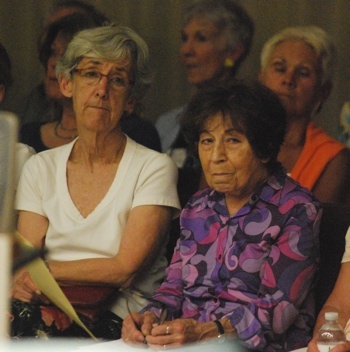 The public hearing on June 17 drew 23 speakers, including many who supported the request. Here are some highlights. Dan Reim is the priest who would serve as head of household for the Jesuits at 1919 Wayne. He thanked commissioners for reconsidering the request, and in general for their service to the city. He responded to three arguments that had been made against the request. First, the definition of “permanent” for a functional family applies to the relationship between the people – not to living at that location, he said. The vows that the Jesuits take, and the common training and path they pursue, makes their relationship to each other permanent and distinct, he noted. They share a common lifestyle and mission – service of faith, and the promotion of justice. Because of this shared vocation, their relationship to each other existed before they lived together, and will continue long after. They are also each other’s patient advocates. Regarding concerns about transiency, Reim said the Jesuits have made a commitment to the ministry at St. Mary Student Parish in Ann Arbor. In the face of declining numbers of priests, the growth of the ministry here has been determined to be worth sending even more priests, he said. For the sake of stability, it would be counterproductive to interchange priests. So he and the other priests here “are likely to be around for quite some time.” The house on Wayne Street is perfect because it has enough bedrooms to accommodate up to six priests, and a living space that fits their religious lifestyle, which he said is similar to a family. If the special exception use isn’t granted, either their ministry will be substantially burdened by limiting the number of priests who can live there, or their vowed life together will be burdened by living in separate houses, Reim said. The city’s R4C districts aren’t likely to have houses with both seven bedrooms and a communal living arrangement suitable for them. He hoped that if they’re allowed to live at 1919 Wayne, their living as good, respectful neighbors will serve to heal any divisions that have resulted from this request. “We can be trusted at our word that we will abide by the conditions determined by the planning commissioners, including that regarding parking,” he concluded. Jonathan Levine supported the request. There are good arguments to oppose it, he said, but he wanted to address three “exceptionally bad ones.” First is the claim that because only men would be able to live there, the special exception would constitute Ann Arbor’s endorsement of gender discrimination. Regulatory permission amounts to determination that the use is allowed by the city’s zoning code, he noted – not an endorsement of ideologies or religious practices. In fact, the city has no problem with single-gender housing – in dorms, sororities or fraternities. A Craigslist ad looking for three female roommates “would not raise an eyebrow and certainly no legal problems,” Levine said. Finally, Levine addressed a claim put forward by the attorney for the Oxbridge Neighborhood Association [Scott Munzel] – that the Jesuits’ vow to accept whatever mission the Pope requires precludes them from being a functional family, since family members’ primary commitment is to each other. “With all due respect to the planning commission, the last thing I want my municipal government doing is interpreting the meaning of religious tenets, as if what you believe is somehow relevant to your fitness to reside in a particular zone,” Levine said. He was particularly surprised by the tone-deafness evidenced by raising the specter of loyalty to the Pope in the course of a political debate. He asked opponents of this request to consider what the zoning determination should be if the applicants were Unitarians, or Buddhists, or Presbyterians. “If the answer is no change, then these claims are an irrelevant smokescreen,” he said. 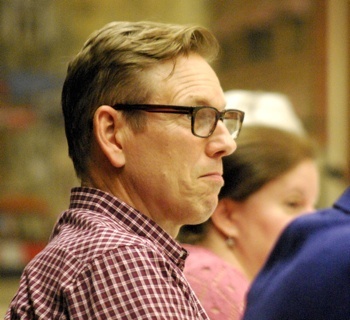 If the answer is that people would feel differently if petitioners were of a different religion, “then you’re suggesting that the city of Ann Arbor engage in religious discrimination. Either way, these arguments deserve to be rejected in the strongest of terms,” Levine said. The city needs to declare that there’s not just one American dream that can be pursued in this town, he said, even in its R1 zone. The special exception use is the appropriate vehicle to do this, he concluded. Levine received a round of applause from the crowd. Also supporting the Jesuits was Liz Kamali. She said she’s a member of the Oxbridge Neighborhood Association. The ONA still hasn’t communicated with its full membership about its position against the Jesuits’ request and hiring an attorney, she said. The attorney fees are estimated at $3,450. That’s the equivalent of the $20 annual dues for more than 170 families. To show that the ONA and the attorney it hired, Scott Munzel, weren’t accurately representing the views of the neighborhood, she said she represented 33 ONA members and other residents who support granting the Jesuits’ petition. She asked them to stand – and more than two dozen people in the crowd stood up and applauded. Kamali said they would be happy to welcome the Jesuits to the Oxbridge neighborhood. Sonia Urbaniak, one of the current owners of 1919 Wayne. If opponents’ concerns were reasonable, wouldn’t they have been made in the open? If the issue was communication, wouldn’t it have been reasonable to invite her and her husband – lifelong ONA members – to the meeting about the possible sale, instead of removing them from the email list? she asked. Why hasn’t the ONA president attempted to get feedback from members since the June 3 planning commission meeting? There might be reasons why some people don’t want the Jesuits to live there, Urbaniak said. She was sure there are similar sentiments about all different groups, both in America and worldwide. She’s from Germany, so it’s harder to think about this issue in that context. “Please, let the laws decide – and not prejudice. Because if prejudice and not laws becomes our advisor, then we’ve lost a lot of the advancements of the last century,” she said. JoAnn Barrett is a realtor representing the owners of 1919 Wayne. She noted that her children grew up in the Oxbridge neighborhood, and she loved the “historic, intellectual and international tapestry of it.” It’s a quiet, safe place where children walk to school and neighbors know one other. They have a neighborhood July 4th parade and picnic every year. JoAnn Barrett, the realtor who represents the current owners of 1919 Wayne. 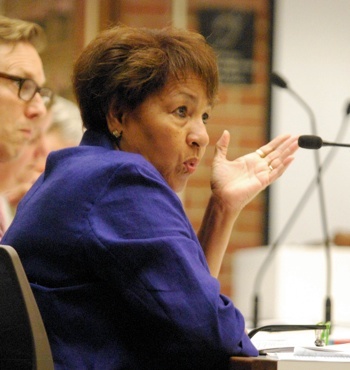 When Ann Arbor is even considering being less inclusive than the state of Michigan, she concluded, “there is something very, very wrong.” She urged commissioners to follow the law and the recommendations of the city attorney’s office. Susan Black said she lives within 300 feet of 1919 Wayne, and has lived there 27 years. Letting the Jesuits live there is the right thing to do. Because of actions by ONA, she said she’s resigned as a board member – even though she’d forgotten she had been on the board until she was notified about the vote to spend $3,500 for an attorney. Regarding parking, Black said are nine parking spaces between the front of her house and the nearby park that no one uses. Regarding property values, she reported that she used Zillow to calculate how much the Jesuits’ home on Ferdon has increased in value over the past six years – it’s worth $160,000 more. “So there goes the property value argument,” she said. Michael O’Donnell introduced himself as a Ward 2 resident and cardiologist – for several years, he was medical director of the interventional cardiology program at St. Joseph Mercy Hospital. “A lot of who I am and what I became are a direct result of my Jesuit education,” he said. O’Donnell knows the Jesuits who are asking for a special exception use and could vouch for them unequivocally. 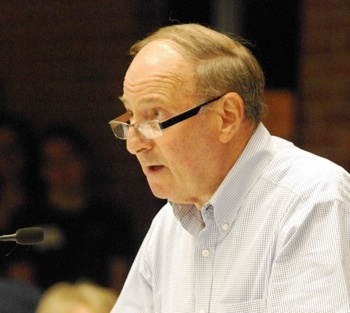 If the request isn’t granted, he said, it will adversely affect St. Mary Student Parish. The priests are an asset to that parish, the surrounding parishes, and the community as a whole, he said. He asked other members of the parish or any others who supported the request to stand up – dozens of people did. Andrea Van Houweling and Eppie Potts spoke against granting the special exception use for the Jesuits at 1919 Wayne. Eppie Potts spoke to oppose the request. She was very disappointed that at the commission’s last discussion on June 3, they didn’t spend much time applying the city code to this case. They shouldn’t rely on the staff report, because it was “full of errors,” she said. It had included or omitted some words that changed the meaning of the city’s ordinance, she said. Potts read from a section from the code that states a functional family does not include any society or association. She defined those words, and concluded that the Jesuits fit that definition. Their loyalty is to the Jesuit community, she noted, and they could be reassigned at any time. “This is not a relationship of a permanent character.” Approving this request would be a violation of city code, she concluded. Local architect Theresa Angelini, a member of St. Mary Student Parish, told commissioners she’s very familiar with the zoning code. It was intended to protect that area from sororities, fraternities and student housing. The Jesuits would be a good fit, she said. “I’m just embarrassed that Ann Arbor is a bit closed-minded in terms of the allowance of this,” Angelini said. She also noted that very few houses in Ann Arbor have seven bedrooms. Paul Morel, co-president of the Oxbridge Neighborhood Association, said ONA held a meeting on May 13 to discuss the functional family request. They sent out 205 emails – of those, 111 were opened, he said, and 33 people attended the meeting. It was the largest attendance in years, he noted. Two things were on the agenda: the functional family petition, and deer in the neighborhood. At that meeting, there was unanimous consensus to prepare a paper outlining the issues with the request. Subsequently, a couple of people – possibly more – changed their mind and decided to support the Jesuits request, he noted. Morel said ONA’s position represents a significant number of residents, but not all. There’s nearly universal agreement that the issue isn’t about whether the Jesuits would be good neighbors, Morel said. Most people believe they are good and honest, with an excellent reputation as neighbors on Ferdon. The issue is whether the use of a functional family in this case is appropriate, he said. ONA’s concern is that approval would set a precedent for future petitions. Paul Morel, co-president of the Oxbridge Neighborhood Association. Morel stressed that the Jesuits don’t qualify as a functional family, repeating some of the same arguments that previous speakers had made. Even if they qualified as a functional family, their request would still fail to meet the city’s standards for a special exception use, he said – because it’s not consistent with the city’s master plan. This is a single-family residential neighborhood, he said, that doesn’t contain group homes, cooperatives, or student housing with more than four occupants. Gwen Nystuen also opposed the request, and said she’s spent a lot of time thinking about this issue. She noted that the Jesuits’ application includes a list of other places throughout the country where groups who are affiliated because of their religion are allowed to live together. She’s become convinced that the planning commission should consider this special exception use for a church use in the R1C district, rather than as a functional family. This would solve many of the concerns that people have raised, she said. The request is really for a parsonage, Nystuen said – it will be owned by a church and occupied by clergy. Lisa Jevens told commissioners that when she walked into city hall that night, four different people asked if she supported the Jesuits and wanted to wear a sticker. “My answer to that is I do support the Jesuits, but I do not support them trying to bend our zoning laws so that they can buy this home,” she said. She’s concerned that the commission is getting distracted by “a big PR campaign,” rather than focusing on the laws and zoning. It’s dangerous and biased to decide zoning issues based on the merits of a particular organization or individuals, she said. 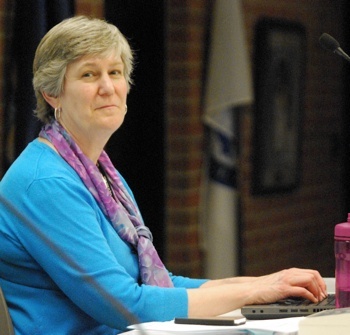 There are other zoning districts in Ann Arbor where six unrelated people can live without a special exception use – or there are special exceptions for church uses, she noted. Every decision does set a precedent, she added, and this would encourage other groups to find ways around the laws as well. Andrea Van Houweling said she’d welcome the Jesuits living next door to her, if they weren’t seeking permission as a functional family. She thought the city was opening a can of worms to many other requests. She supports granting them a special exception use as a church use, because she thinks they are a parish house or a parsonage. With that, they’d be welcome almost anywhere in town, she said. 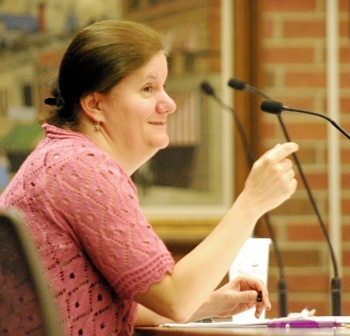 Karen Snyder attended the meeting to provide interpretive services for the hearing impaired. She was hired by the city at the request of a citizen. Michael Clark lives in a property adjacent to 1919 Wayne. This debate has made it clear that the wording of the ordinance is unclear, he said. Clark said the planning commission should have asked the zoning board of appeals for clarification. Approving this request would set a precedent of any group that says they function as a family, he said. If this request is approved, he plans to appeal to the zoning board of appeals. The attorney for the Jesuits, Cevin Taylor, read a section of the zoning ordinance that relates to residential occupancy. The Jesuits are simply asking that the city let them accommodate their centuries-old living arrangement, he said. They’ve demonstrated clearly that they meet the definition of functional family, he said. All they’re asking is to be treated like any functional family, and not to be held to a higher standard compared to other families. It’s actually against the law to do that, Taylor said. Taylor cited the Michigan Supreme Court ruling in Delta Charter Township v. Dinolfo, as well as the federal Religious Land Use and Institutionalized Persons Act. Taylor also objected to the argument that because the Jesuits have a commitment to their order, that it precludes them from having a commitment to each other. In his family, Taylor said, members have a commitment to their church as well as to each other – it’s not an either/or choice. He asked that commissioners approve the petition. Susan Friedlander introduced herself as an attorney representing the Clark family. She said the city’s ordinance doesn’t define the terms “society” or “organization.” So courts typically go to the dictionary. She read a definition of society, and said she was concerned about equal protection under the law. The question is how the city applies its ordinances evenly to everyone. But the ordinance isn’t clear, Friedlander said. If the Students for a Democratic Society came in and wanted to live in that neighborhood, would they be allowed? Another concern is how the ordinance should be interpreted regarding permanence. Several other residents also voiced support of the Jesuits’ request, including Vivian Johnson, Sherry Moravy, Laura Paterson, Peggy Lynch, Masoud Kamali and Aaron Blizzard. The discussion among commissioners lasted over 90 minutes, followed by a vote. This report summarizes and organizes the deliberations thematically. Addressing the assertion during public commentary that the language in the motion did not match the language in the code, Ken Clein suggested amending the motion to reflect the language of the city code, by adding two words: “…relationship is of a permanent and distinct character…” The amendment was accepted as friendly. The Ann Arbor Jesuit Community is not a social society, club, fraternity, sorority, association, lodge, organization or group of students or other individuals in a temporary housekeeping unit in which the common living arrangement or basis for the establishment of the housekeeping unit is temporary. She suggested deleting “social” and “in a temporary housekeeping unit,” noting that those phrases aren’t part of the city’s ordinance. City planner Alexis DiLeo replied that the motion reflects the staff’s findings, and that the commission is free to amend it. Briere said that one of the concerns she’s heard is that the staff is rewriting the ordinance for this request. She thought that impression comes from the fact that the language in the motion closely echoes the ordinance, but doesn’t use the exact same language. In the future, she hoped that when the motion mimics the ordinance so closely, it uses the same language. Briere’s suggestion wasn’t acted on at this point. Later in the meeting she again proposed deleting the word “social,” which was then accepted as a friendly amendment. Responding to a query from Bonnie Bona, Alexis DiLeo explained that the city’s zoning board of appeals is a quasi-judicial body that has two primary roles. One is to grant variances to the city’s zoning. They are also charged with interpreting the city’s zoning ordinance. The ZBA is not an “approving” body, DiLeo said – that is, they don’t approve site plans or other zoning proposals. The powers of the ZBA are laid out in the city code – Chapter 55, Section IX. (1) Administrative review: To hear and decide appeals where it is alleged by the appellant that there is error in any order, requirement, permit, decision, or refusal made by the Building Official or any other administrative official in enforcing any provision of this chapter. Appeals shall be filed within 60 days of the date of the decision in question. (2) Variances: To authorize variances pursuant to section 5:99. (3) The Zoning Board of Appeals shall have the power to approve the substitution of 1 nonconforming use for another, as provided in section 5:86. (4) The Zoning Board of Appeals shall have the power to approve the continuation or replacement of a nonconforming structure as provided in section 5:87. Planning manager Wendy Rampson clarified that the ZBA has the authority to hear appeals – for example, if the staff turns down a permit. But Bona pointed out that the ZBA is not the interpreting body for the planning commission. The ZBA isn’t an advisory board, she added. During the public hearing, the issue of revising the ordinance related to functional families was raised. Bonnie Bona asked staff to explain how ordinances are revised, and when those revisions are appropriate. Alexis DiLeo explained that the process at this point would involve tabling or denying the petition in order for an ordinance change to occur. In Ann Arbor, anyone can file a petition for a text amendment to a city ordinance. For example, at the commission’s June 3, 2014 meeting, they approved an ordinance amendment that was brought forward by owners of property on Research Park Drive. If the ordinance change is approved – first by the planning commission, then by the city council – then the petition that was tabled could be brought back for consideration. If the petition was denied, the petitioner could reapply under the revised ordinance. In the case of the Jesuits’ request, DiLeo wasn’t sure they’d want to wait that long. Planning manager Wendy Rampson elaborated, saying that an ordinance revision could also be initiated by city council or the planning commission. Bona asked another question: Once a proposal is already in front of the commission, can the rules under which it’s evaluated change? Yes, Rampson replied. However, going through an ordinance change takes a minimum of three months, and probably more like six months. If someone has brought forward a petition in good faith to apply under the current code, Rampson said, the commission typically hears that petition under the existing code – and then follows up later with an ordinance revision, if they believe that’s necessary. Bonnie Bona asked staff to address concerns that were raised about setting a precedent. Alexis DiLeo replied that this particular special exception use sets a very high bar for the next request. She outlined specific characteristics of the Jesuits as a functional family, including lifetime vows, the power to make medical decisions for each other, and the pooling of resources. Planning manager Wendy Rampson added that every case is unique. DiLeo clarified that other groups would need to be equally as specific in making their case. Bona noted that people on both sides of this request have asked for examples in other communities. But she said she didn’t recall the planning commission ever using a previous special exception use in order to evaluate a current request. Jesuit Request for 1919 Wayne: Commission Discussion – Parsonage? 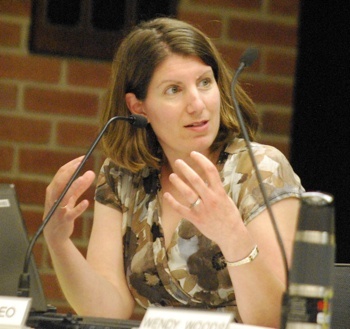 Referencing a suggestion made during the public hearing, Wendy Woods asked whether anyone had considered making the special exception use as a church use rather than as a functional family. Alexis DiLeo said the original request from the Jesuits was for a functional family, and planning staff did not suggest the alternative of a church use. She noted that the city code doesn’t specifically mention parsonages, and churches are regulated as places of assembly. The Jesuits aren’t planning to use the house as a place of religious assembly, she added. Woods said her thought was that as a church, the property might become tax-exempt. 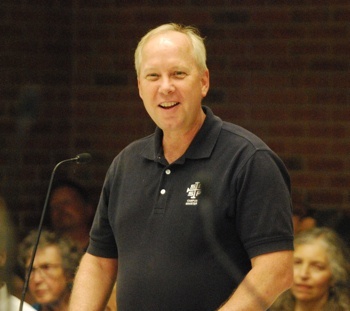 Kirk Westphal brought up another issue raised during the public hearing: Why couldn’t the Jesuits live in another zoning district that would allow six unrelated people to live there without a special exception use? He asked whether that was part of the commission’s purview. Alexis DiLeo replied that the staff reviewed the application based on what was requested – a special exception use for 1919 Wayne. Westphal also asked about enforcement. DiLeo replied that any member of the Ann Arbor Jesuit community would meet the definition of this particular functional family. If non-Jesuits live at 1919 Wayne, that would not be in compliance with the special exception use. Enforcement is typically complaint-driven, and the city’s response usually starts with a phone call or letter, she said. Beyond that, the staff proceeds with action on a case-by-case basis. Westphal asked what would happen if it becomes a house where only students live. If the students are Jesuits and meeting all of the other conditions of the SEU, DiLeo said, they wouldn’t be violating its terms. Westphal then asked whether the city ever restricts use based on whether residents are students. No, DiLeo said. Bona asked Dan Reim, the priest who will serve as head of household, to describe what it means to be a Jesuit. “Could I become a Jesuit?” she quipped. Reim described the Jesuits as a religious order within the Catholic church. The most common type of priests are diocesan priests, who are typically involved in a parish church and live in a rectory. There are also religious orders – like the Franciscan, the Benedictines, the Augustinians, and the Jesuits. All of those orders were created because of a particular need or inspiration or individual, he said. Diocesan priests take vows of chastity and obedience to the bishop. Religious orders take those vows too, Reim explained, but in addition take vows of poverty and hold their material goods in common. 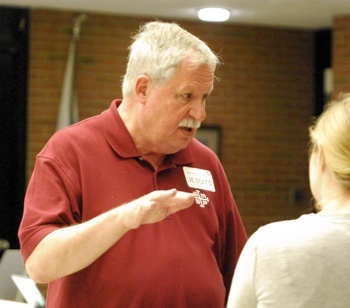 Planning commission chair Kirk Westphal talks to Bonnie Bona before the start of the June 17 meeting. Reim noted that priesthood is reserved “currently” to males – a comment that drew laughter from the crowd. He said he’d be happy to share his personal views on that issue sometime. Bona also asked about the vows that Jesuits take, compared to the relationship among the Jesuits themselves as a functional family. Reim replied that the Jesuits’ allegiance is both to their religious order and to each other. His vow of obedience means he doesn’t determine where he lives or works – that’s determined by his religious superior, who doesn’t currently live in Ann Arbor. But the Jesuit Constitutions also define their allegiances to one another within the Jesuit community, although they don’t take vows to each other. Bona noted that at the June 3, 2014 meeting, Reim had spoken about other aspects of the Jesuits’ commitment to each other, such as their approach to conflict resolution. Reim said the Jesuits are committed in their mission together – it’s not just an individual choice. Westphal asked Reim to confirm that the Jesuits’ vows preclude them from establishing a biological family in the traditional sense. Reim confirmed that there would be no families, women or children living at the house. (4) In this section, functional family means a group of people plus their offspring, having a relationship which is functionally equivalent to a family. The relationship must be of a permanent and distinct character with a demonstrable and recognizable bond characteristic of a cohesive unit. Functional family does not include any society, club, fraternity, sorority, association, lodge, organization or group of students or other individuals where the common living arrangement or basis for the establishment of the housekeeping unit is temporary. She asked McDonald whether the following rephrasing of the ordinance would provide the same criteria: “A functional family does not include any group of individuals where the common living arrangement or basis for the establishment of the housekeeping unit is temporary.” She said some people were attempting to define the word “society” or “association,” and she was attempting to clarify the intent of the ordinance. From left: Assistant city attorney Kevin McDonald talks with planning commission chair Kirk Westphal. It’s the planning commission’s job to determine whether the Jesuits’ petition meets the definition, he said. McDonald noted that the city attorney’s office did some of the background work for this issue. Other communities in Michigan include this same general language in their ordinances. Just asking the question of whether or not a group is a society or association isn’t enough, he said – you have to read the entire context of the ordinance. Regarding students, McDonald noted that it would be possible for both he and his wife to be taking classes, as well as their children. So they could theoretically be characterized as students – even though they are also a family. Briere then said she interpreted the phrase “relationship must be of a permanent and distinct character” as a reference to the permanence of the relationship, not of the housing unit. McDonald thought that was a reasonable interpretation. He also noted that the special exception use in this case would apply to the type of functional family, which he said suggests that the relationship among individuals would be permanent. A traditional family that might move into a house has a relationship that’s permanent, but that doesn’t mean the same people stay at that location forever, he said. The same would be true for a functional family. RLUIPA applies when there’s an individualized assessment of a proposed land use, McDonald said – meaning that the city would be making a specialized decision on the facts of the matter regarding whether the land use can be approved. McDonald said some people would argue that an SEU is an individualized assessment. He said he wasn’t going to give his opinion or advice about whether the city’s action in granting this SEU would be in violation of RLUIPA. Sabra Briere, who serves on both the planning commission and city council. Briere then asked McDonald to explain why the Michigan Supreme Court ruling in Delta Charter Township v. Dinolfo applies to the Jesuits’ petition. 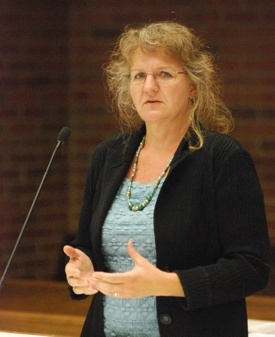 McDonald said the city of Ann Arbor has a thick file of material from that period in the 1980s and early 1990s, when the functional family designation was added to the zoning ordinance. It was adopted in 1991. The Dinolfo decision meant that the city could make a determination about the number of people who could occupy a house, and that certain zoning areas could be protected – like single-family residential districts. But the case called into question whether a city could use only a biological family definition, he said. The court found that cities were making too narrow of a definition of “family” – so they needed to have an alternative. McDonald noted that in some cities, the ordinance language includes “religious order” as a type of functional family. Wendy Woods asked if McDonald knew whether the city had previously granted a functional family designation for a special exception use. McDonald said he believed this is the first petition of this type in Ann Arbor. What’s more, when the staff contacted other communities in Michigan, they couldn’t find any city that had any significant history regarding the functional family designation. McDonald also responded to some comments he’d heard during the public hearing. He stressed that the city attorney’s office had come to no conclusion about the Jesuits’ petition – they weren’t making a recommendation, as some speakers had stated. 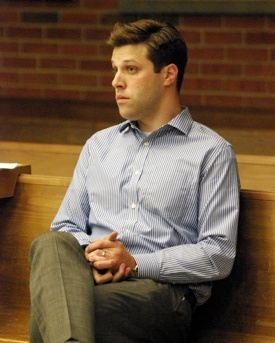 Responding to an additional query from Westphal, McDonald stated that each request for a special exception use is different, and approval depends on a specific set of facts and circumstances. Regarding the issue of precedent, McDonald said he’d heard some concern about factual precedent – that this would open the door for all kinds of other uses. He noted that every petition is scrutinized – as evidenced by the deliberations at this meeting – by staff and planning commission, to make sure it meets the requirements of the city’s code. Bonnie Bona confirmed with Alexis DiLeo that the neighborhood has a residential parking program. 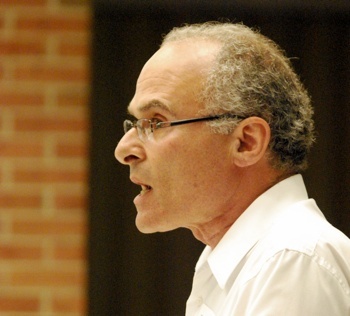 DiLeo explained that residents can purchase parking permit stickers. Unless you have a permit, parking on the streets is limited to two hours. There’s a limited number of permits that each household can purchase. With the sticker, you can park an unlimited amount of hours. Bona said there might be an issue with the city giving away too many permits per household, but she noted that it’s a different issue than the request from the Jesuits. Eleanore Adenekan asked about parking for guests who visit the house. How long might guests stay? she asked. Dan Reim, who’ll serve as head of household for the Jesuits, said he tries to follow the “rule of fish” – three days, and they begin to stink. There are no plans to have long-term guests, he said. Adenekan confirmed that guests would be parking on the street. Reim said that if there’s a problem, they’d deal with it. “I don’t want parking to be the reason why we’re not able to have this house,” he said. Wendy Woods asked if the Jesuits would be able to get residential parking permits. DiLeo replied that households in that neighborhood could have a total of five residential permits. That option would be available to any household in the Oxbridge neighborhood, including the Jesuits. Kirk Westphal cautioned against rewording the motion in a way that would make it more confusing – and therefore more likely that certain conditions might be violated. After additional discussion that included a variety of hypotheticals, Wendy Woods said it seemed like the commission was going in circles. She didn’t think they needed to get caught up in laying out details of allegiances between individuals or the broader church community. Woods was also concerned about additional wordsmithing of the motion, saying she didn’t think it needed more information. “I really am concerned that we’re really starting to get down into the weeds.” She said she hadn’t changed her mind since June 3, and still supported it. Ken Clein agreed with Woods. He thought the commission needed to be careful about holding the Jesuits, as a functional family, to a higher standard than other families. “That starts to sound like discrimination,” he said. Clein wasn’t concerned about setting precedent, noting that each case is different. And in the past 23 years, there haven’t been a large number of these requests anywhere in Michigan. He didn’t see it as being detrimental to the neighborhood. Eleanore Adenekan also agreed with Clein and Woods. She thanked the public for their letters and emails, and for attending the meeting. All commissioners have put a lot of time into this issue, and some commissioners – including her – had changed their schedules so that they could attend this meeting, she said. Adenekan cited several issues that had been raised, and expressed concern about holding the Jesuits to a higher standard than other households. She supported their petition. She believes Ann Arbor is a community based on inclusion and acceptance, and that the Jesuits and others in this neighborhood can live together peacefully. Diane Giannola said the issue isn’t about religion at all. It’s not about whether the Jesuits can buy a house, or whether four Jesuits can live in a house – because that’s allowed by code. The issue is whether this petitioner qualifies as a functional family, she said. Her problem is that an entire religious order is being characterized as the functional family. If six individual Jesuits came forward with this request, then she’d support it as a functional family. But an entire religious order, where people move in and out based on what they’re told to do, isn’t a functional family. “It goes against the entire spirit and purpose of why the functional family was developed,” Giannola said. They have taken lifelong religious vows to the Jesuit order and intend to reside at this address indefinitely. They will assume The commitment of the Ann Arbor Jesuit community to each other assumes roles such as head of the household, pool financial resources, assign responsibilities such as cleaning, shopping and yard work, and have adopted other features of a cohesive family unit such as caring for sick members and making medical decisions for each other, as necessary. Outcome on Bona’s amendment: It passed unanimously. Briere asked to delete “social” from the following sentence in the motion: “The Ann Arbor Jesuit Community is not a social society, club, fraternity, sorority, association, lodge, organization or group of students or other individuals in a temporary housekeeping unit in which the common living arrangement or basis for the establishment of the housekeeping unit is temporary.” She thought it might cause confusion. 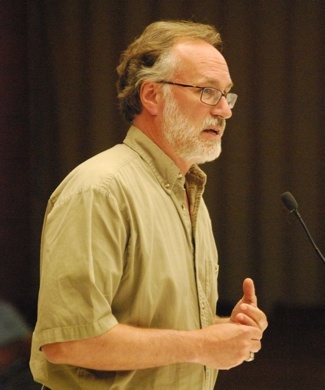 Ann Arbor planning commissioners vote on the Jesuits’ request. It was accepted as a friendly amendment by Clein, who had originally moved this item, and by Adenekan, who had seconded it. Giannola argued that the word “social” is needed in the phrase “social society,” because “society” is in the petitioners’ name: The Society of Jesus. However, no further action was taken to re-insert the word. 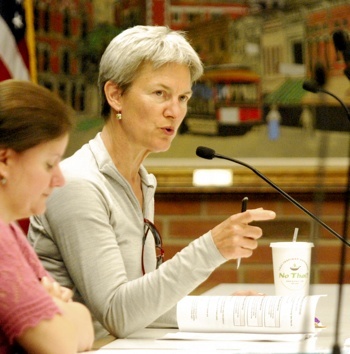 Briere said she respected the concerns that people had voiced – not just from the neighborhood, but from the broader community – about whether the planning commission would approve more functional family designations in the name of increasing density. “I do not find that to be the case,” she said, though she understood the concern. Westphal said he had been hesitant on June 3 because he’d wanted time to address community concerns – that’s why he had previously favored postponement. He thought staff had been very thorough in making sure the motion reflected the city code’s definition of functional family. The SEU also has to comply with all the city’s special exception use standards, he noted. He was very comfortable with granting the SEU to this applicant, because it met the functional family definition and the SEU standards. He didn’t feel the commission would be setting a precedent. a. The members of the Ann Arbor Jesuit Community who propose to reside at 1919 Wayne Street have a relationship that is functionally equivalent to a family in that their relationship is of a permanent and distinct character with a demonstrable and recognizable bond characteristic of a cohesive unit. They have taken lifelong religious vows to the Jesuit order and intend to reside at this address indefinitely. 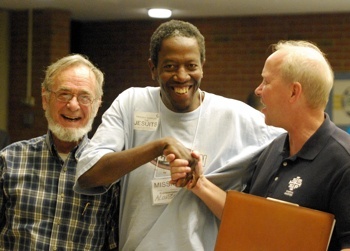 The commitment of the Ann Arbor Jesuit community to each other assumes roles such as head of the household, pool financial resources, assign responsibilities such as cleaning, shopping and yard work, and have adopted other features of a cohesive family unit such as caring for sick members and making medical decisions for each other, as necessary. b. The Ann Arbor Jesuit Community is not a society, club, fraternity, sorority, association, lodge, organization or group of students or other individuals in a temporary housekeeping unit in which the common living arrangement or basis for the establishment of the housekeeping unit is temporary. 2. A functional family with an approved special exception use is considered a single family residential use, and thus is consistent with the objectives of the City Master Plan, and with the existing and planned character of the neighborhood. The household size is within the normal size range of households found in this zoning district, and will not have a detrimental effect on neighboring property or the natural environment. 3. No changes are proposed for the current site, which conforms to the R1C zoning district. Adequate off-street parking for the household will be provided, and the use of the site will not be hazardous or inconvenient to the neighborhood. 4. The approval will apply only to a functional family made up of no more than 6 individuals of the Ann Arbor Jesuit Community. 5. 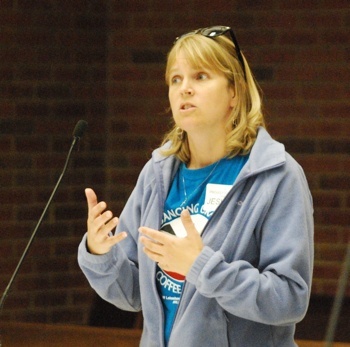 The Ann Arbor Jesuit Community has identified a contact person who will act as head of household in relating to the city. Outcome: On a 7-1 vote, commissioners approved the special exception use, as amended, for 1919 Wayne St. Diane Giannola dissented. It does not require additional city council action. 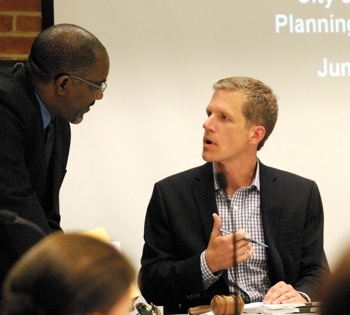 After being postponed at the Ann Arbor planning commission’s June 3, 2014 meeting, a proposal by the Ann Arbor housing commission to expand low-income housing on North Maple Road was back on the June 17 agenda. The plan calls for demolishing 20 existing single-family homes – the public housing complex known as North Maple Estates – and constructing an eight-building, 42-unit apartment complex with a total of 138 bedrooms. The units range in size from one bedroom to five bedrooms. The project would include a playground, community building and 73 parking spaces. According to a staff memo, the buildings would be located along a T-shaped driveway that connects to North Maple Road and Dexter Avenue. The drive extends northward toward Vine Court but does not connect with that street. There would be a new connection to Dexter Avenue through the remaining, undeveloped length of Seybold Drive. The project also requires the city to vacate a portion of the right-of-way for Seybold Drive. The surrounding land is owned by the housing commission, so if the right-of-way vacation is approved, the land would become part of the housing commission property. In a separate item, the planning commission was also asked to recommend approving that request. On June 3, several nearby residents had raised concerns about the project, including issues with security, impact on adjacent property, and traffic exiting onto Dexter Avenue. In addition, the planning staff had recommended postponement so that the housing commission staff could address some outstanding issues with the project. On June 17, the planning staff recommended approval and noted that housing commission staff and the project’s team had talked with residents after the June 3 meeting to address concerns. Five people spoke during the June 17 public hearing, either asking questions or expressing support. 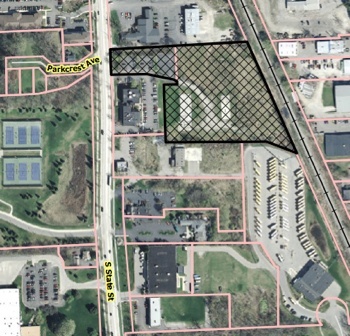 The parcel containing two duplex buildings also owned by the Ann Arbor Housing Commission in the northeast corner of the site must be combined with the subject site, forming a single parcel as a requirement for issuance of any permits. The legal description and comparison chart data must be confirmed to include the duplex parcel. The northern-most parking stall, nearest the connection to Vine Court, must be relocated outside of the minimum front setback area. According to the staff memo, after June 3 the city’s traffic engineer reviewed the proposed new connection from Seybold Drive onto Dexter Avenue, and concluded that sight distances from all approaches are acceptable. He suggested that the pavement markings on Dexter should be refreshed. The reconstruction of North Maple Estates is part of an ongoing effort by the housing commission to upgrade the city’s housing stock for low-income residents. 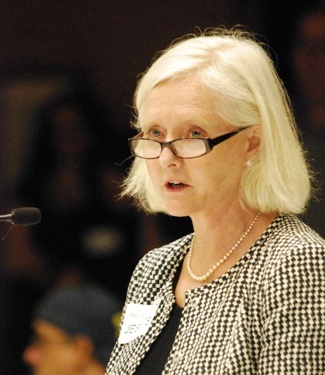 At the planning commission’s May 6, 2014 meeting, AAHC executive director Jennifer Hall had made a presentation about the initiative, which includes seeking private investors through low-income housing tax credits. Five people spoke during the public hearing for this project. Susan Push, a resident who lives near the proposed North Maple Estates. Susan Push told commissioners that she lives on Allison Drive, west of the North Maple complex. Her house is closest to the current basketball court, which is highly used. She didn’t see a new court in the proposed plans, and wanted to say it’s a valuable asset to people who live at North Maple Estates. Another Allison Drive resident, Joyce Garrett, said it looked like Seybold Drive would be going through Scio Township property, and she wondered if the township would be vacating that section. John Mouat, the project’s architect, talked about concerns that had previously been raised by nearby residents – density and setbacks on the property’s west side. The site is 4.2 acres. If zoned R4B, then theoretically there could be up to 72 units on the property, he noted. This project proposes 42 units. “So I think we’re trying to find a nice balance point between what’s there now, and at the same time accomplishing getting more units on the site.” Regarding setbacks, Mouat said the existing buildings on the site have setbacks of between 14-22 feet from the property line. In the proposed plans, the building setbacks would vary from 37-57 feet. Mouat also responded to Push’s comments about the basketball court. He said the site has a significant grade change, so it’s difficult to find an area with a large, flat surface for the court. Gwenyth Hayes, the resident representative on the Ann Arbor housing commission. 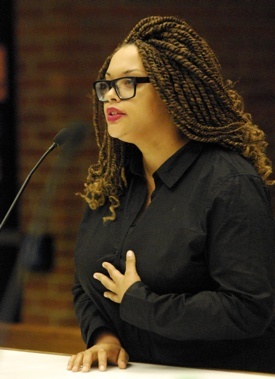 Gwenyth Hayes introduced herself as a recent graduate of the University of Michigan School of Social Work and the resident representative on the Ann Arbor housing commission board. At the June 3 meeting, the main voices that were missing from the discussion were the voices of public housing residents, she said. They’re the ones who’ll be living there, and this renovation is very important so that they’ll have a quality place to live. She has visited public housing in other cities, and knows that Ann Arbor’s public housing is among the best, and the city should keep it that way. Regarding comments on June 3 that there should be a fence around the complex, Hayes thought that was painting public housing residents with a broad brush. If it weren’t for public housing, she wouldn’t have been able to make it from a homeless teen to a woman with a master’s degree. That transformation was possible because of safe, affordable housing, she said. “A lot of times in Ann Arbor we talk about diversity. It’s important that we also include not just cultural diversity, but also socio-economic diversity,” Hayes said. That’s why the city needs more affordable housing, she added, and the added units on this site are definitely needed. For people who are concerned about crime, Hayes said that as a resident of public housing, she knows that all residents aren’t criminals. “We don’t like crime either, and we’re more likely to be the victims of the crime than the people in the surrounding neighborhoods.” Public housing residents are just as much a part of the fabric of the neighborhood as anyone else, Hayes concluded, and she wanted to make sure their voices are heard. After praising Hayes’ commentary, Caleb Poirier told commissioners that he’s a member of the nonprofit MISSION and an organizer with the larger homeless community. He was impressed by the scrutiny given to the Jesuits’ request for a special exception use – it shows that commissioners think about things exceedingly carefully, which he thought was a good trait. He supported Hayes’ comments, saying that people in Ann Arbor need a home – including people who can’t afford one, and people who don’t have one at all. He’s excited that more housing is being created, after about a decade when no affordable housing was built. John Mouat, architect for the North Maple Estates project. For people who live near low-income housing, Poirier said they are often scared of people they haven’t met yet, and that’s understandable. That fear usually goes away when you start meeting people and their kids, and discover their personalities. “I encourage those who are scared to take that step,” Poirier concluded. Jennifer Hall, executive director of the Ann Arbor housing commission, said they’re trying to be a good neighbor to surrounding residents. One way to do that is to maintain the AAHC properties. She mentioned the reduced funding from HUD, and said this new approach is an opportunity to improve the housing as well as the neighborhoods. “The last thing we want to be is the worst house on the block,” Hall said. Regarding the basketball court, Hall said they’ve talked about it. Right now, it’s located on the highest part of the site, which is the best place to put housing because of water issues. But the lower parts of the site are hilly, so there’s not a good spot for it. They’ve talked about this issue with Peace Neighborhood Center, which provides much of the summer programming for kids at North Maple Estates. That community center is a couple of blocks away. Sometimes the basketball courts at AAHC sites are used by non-residents, and littler kids get pushed away from playing, she said. AAHC decided that having more housing on the site was more critical than a basketball court, but they do provide other recreational opportunities, Hall said. Bonnie Bona asked about the intersection of Seybold and Dexter, and the traffic engineer’s comments about refreshing the street markings. What’s the plan for doing that? City planner Alexis DiLeo indicated that the city – not the housing commission – has responsibility to do that. 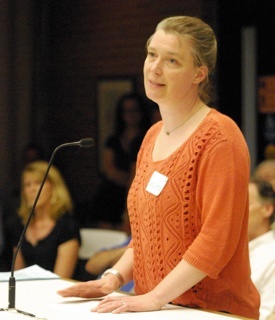 Jennifer Hall, executive director of the Ann Arbor housing commission. Bona then noted that she’s struggling with the increased density that would be allowed under the new zoning. She knows there are more units, but wondered how many more bedrooms there will be. Jennifer Hall replied that there are currently 10 five-bedroom units and 10 four-bedroom units at that location. One of the five-bedroom units has been converted into a community center. The new site would have a greater diversity of unit sizes, in addition to keeping the same number of four- and five-bedroom units. The number of bedrooms will increase from 90 bedrooms to 138 bedrooms. Regarding density, Bona said she wasn’t concerned about this proposal, but about potential future uses on that site. After the city rezones this property, the potential for the city to sell this site and build it to the maximum allowable density concerns her. Hall replied that HUD has a permanent restriction that the property must be used for affordable housing. Without HUD’s approval, “the city has zero authority to sell it,” she said. It’s as permanent as the federal government is, she said. John Mouat added that given the site’s strange shape, topography and needs for stormwater management, it would be quite challenging to build the maximum allowable number of units. Bona noted that it would just entail adding additional floors to the buildings. She said she’s very supportive of adding new units throughout the AAHC, but just had concerns about this site. Paras Parekh asked about the temporary displacement of current residents, and whether they’ll be given priority for the new units. Hall said AAHC can’t make people homeless – so alternative housing will be found for current residents. Residents will be offered Section 8 vouchers, which can be used to subsidize private sector housing costs. If someone can’t find a place or doesn’t want to use a voucher, there are other AAHC units that they can be moved into, she said. Current residents will get first choice in moving back into the new development, if they want. AAHC is required to cover all moving expenses, application fees and other costs so that residents aren’t burdened when they move. Regarding a timeline, Hall said AAHC will be applying for financing (low-income housing tax credits) in October of 2014, and should find out by January 2015 whether they’ve been awarded the financing. If that happens, “the other pieces will fall into place,” she said, and construction will begin later that year. Kirk Westphal asked where the nearest park is located. Veterans Memorial Park is about a block away, Hall said. She noted that Peace Neighborhood Center brings a bus to the site and takes kids to all kinds of after-school recreational activities. Responding to a query from Westphal, Hall described the bike parking that will be on site. In talking with planning staff about installing Grade A bike parking (an enclosed, lockable shed), Halls said no one would use it. Residents don’t have high-end bikes, so the enclosures “would likely be used for something else,” she said. Hall added that she’s highly skeptical that residents will even use the bike hoops that are proposed. Diane Giannola asked about the issue raised during the public hearing: Was the property being vacated for Seybold Drive a part of Scio Township? DiLeo replied that some of the nearby parcels are in Scio Township, but the pieces to be vacated are not, and don’t abut those township parcels. The housing commission owns both sides of the right-of-way that will be vacated, and AAHC will own the property after it’s vacated. Westphal asked about the fencing on the west side of the site. Hall said the fences aren’t owned by AAHC – they were put up by owners of the adjacent residential properties. Because of the site’s grading and upkeep, it’s not feasible to install a fence on AAHC property, she said. They’ll be putting in a lot of trees and other landscaping along that property line, she said, and regulations state that a fence can’t touch any part of a tree. She’d like to put in rose bushes or raspberries along that edge, because pricker bushes are an effective way to prevent people from cutting through property. For all their properties, they like to have as much barrier as possible – to prevent people who aren’t AAHC residents from coming in – without having it feel like a prison, she said. Eleanore Adenekan asked about electrical outages in the neighborhood that are mentioned in the staff report. DiLeo reported that she lives in that neighborhood, and the area does seem to experience more power outages than other parts of the city. She thought it was because they have above-ground power lines and a lot of trees. She didn’t think it had anything to do with the AAHC site in particular. Outcome: Commissioners unanimously recommended approval of rezoning, site plan, development agreement, and street vacation for the North Maple project. It will be forwarded to the city council for consideration. A proposed 78-unit apartment project on South State Street was on the June 17 agenda. Aerial view of State Street Village site. Commissioners were asked to approve a site plan, development agreement and rezoning for the State Street Village, a $10 million project put forward by Ann Arbor-based McKinley Inc. at 2221-2223 S. State St. The plan calls for constructing two 4-story apartment buildings at the rear of the site, totaling 112,262 square feet, with 38 units each. Another 2,027 square foot building – for a leasing office with two apartments above it – would be built on the front of the parcel, on South State. The development will include 114 parking spaces in the rear of the site and 13 spaces for the front. Another 22 spaces in the surface parking lot will be shared by the existing office building just south of the site. In addition, 44 covered bicycle spaces and 8 enclosed bicycle spaces will be provided near the entrances of the apartment buildings and 2 hoops will be placed near the entrance of the rental office building. Instead of making a $48,360 requested donation to the city for parks, McKinley has proposed two 8×10-foot grilling patios with picnic tables and grills. According to the staff memo, the footing drains of 18 homes, or flow equivalent to 71.91 gallons per minute, will need to be disconnected from the city’s sanitary sewer system to mitigate flow from this proposed development. City planner Alexis DiLeo said the staff inquired about whether this proposal could include affordable housing, and the developer is assessing the financial feasibility of that. Staff was recommending approval of the rezoning and site plan. Only one person spoke during the public hearing: Eric Toumey, representing McKinley Inc. He said was there to answer any questions. Paras Parekh confirmed with Eric Toumey that the primary use for the site would be residential. Parekh wondered if there would be a more appropriate zoning than O (office). Eric Toumey, a representative for McKinley Inc.
Planning manager Wendy Rampson replied that office zoning provides the most flexible zoning district for mixed-use development. If it were zoned for residential, it would prevent any future office or other types of uses. So the master plan recommends office zoning, she said. It’s an area where the city hoped to encourage mixed use and residential development, where in the past it has been primarily industrial. Rampson further elaborated that the office designation allows for the greatest flexibility for residential development, because it’s based on floor area rather than dwelling units per acre. It allows for a variety of different housing types. Toumey replied that the traffic study they’d done indicated that the development would have minimal impact in terms of traffic on State Street. In addition, there will be 44 bike parking spaces. They’re also looking at the possibility of indoor bike parking, and Toumey noted that there’s a bus stop nearby on South State. Bona observed that the stop for the southbound bus is on the opposite side of the street. She wondered where pedestrians would cross. City planner Alexis DiLeo replied that the nearest signal for crossing is south of the site, at Oakbrook Drive. Bona said this apartment project might help push the city and the Ann Arbor Area Transportation Authority to make sure there’s adequate ways to cross. “What we don’t want is tenants darting across the street in the middle of busy traffic,” she said. Regarding the housing costs, Bona wondered if the apartments were intended to be subsidized low-income units or market rate. The design makes the apartments look low-income, she said, because there are no balconies and the buildings are “fairly bland.” If they’re intended to be market rate, a lot more amenities could be added, she said. Architect David Esau of Cornerstone Design. Toumey replied that the apartments aren’t low-income, but the cost will depend on the type of financing they secure – low-income housing tax credits, or conventional financing. If they decide to offer affordable housing, it would be directed toward people with 60% of Ann Arbor’s area median income (AMI). For a dual-income household, 60% AMI is still fairly high, he said – about $80,000. People in that range might work at the nearby 777 Building, or Briarwood Mall, or nearby hotels, or the UM athletic department. The development will target mid-income individuals, he said. Bona asked if they thought about enhancing the buildings. The windows seemed minimal, she said. Toumey said the first-floor windows needed to be slide windows for purposes of ADA requirements, and for design consistency they decided to use that type throughout the building. Regarding exterior materials and amenities, Toumey said he’s visited two competing properties within this submarket, and he thought this McKinley development would be superior to those. Toumey said 60% AMI is about $80,000 for Washtenaw County, so it’s relatively high. He noted that from State Street, the only thing visible will be the rooftops of the buildings at the back of the site, because the grade is so steep. More superior materials will be used on the leasing office, which is visible from South State, so that it will be more attractive, he said. Bona replied that she’s not thinking of it from the perspective of someone driving by, but rather from the perspective of someone living there. State Street has great potential, she added, “and I’d just like to set the bar higher.” However, there’s nothing in the zoning that prevents this project as proposed, she added. Diane Giannola pointed out that there’s very limited bus service on State Street – there are no weekend or late-night buses that service the corridor. Toumey said they’d consider trying to get better bus transportation there. Giannola encouraged Toumey to ask the AAATA about it. Parekh asked if they’d considered putting in any office units. Toumey said McKinley owns an office building adjacent to this site. The State Street corridor plan calls for some integrated types of land uses, Toumey said. But it’s not suitable to have commercial space on the ground floor, he added, because “there isn’t the walkability factor on State Street.” They needed to have a leasing office there, Toumey said, noting that it might be considered commercial space. Responding to a query from Wendy Woods, Toumey said their intent is not to market the apartments to university students. McKinley has high requirements on the lease applications, he added, and if a student meets that standard and potentially has a co-signer, they wouldn’t be opposed to it. But “from the long-term interior maintenance perspective,” he said, “we’d prefer to have families.” He said lease requirements include criminal background checks and restrictions on the type of dog that is allowed, among other things. Woods thought that many UM students could meet those standards. She said she works with students, so she gets defensive on their behalf. Sabra Briere brought up the parking lot, saying that it’s a lot of impervious surface. Toumey replied that there are three bioswales on the site, in addition to the detention pond, to handle stormwater. Briere said she was confident that they met the requirements, but wished they could come up with a way to reduce the hard surface. She asked if they’d considered putting parking underneath the buildings. The McKinley representatives indicated that it would be costly to do that. The project’s architect, David Esau, explained that it would require an additional floor of structure to support the buildings above the parking. In addition, the building code limits this type of construction to four stories, so they’d lose a floor of apartments. Briere thought it was a shame, but said she wasn’t blaming the developer. She knew they were meeting code – she just wished the city had a better way of dealing with these things. Esau said the site would be making a significant improvement compared to the existing stormwater management in the area. Bona noted that the city code only requires 86 parking spaces for a development this size, yet the complex will have 127 spaces. In the past, the commission has considered having a maximum number of allowable spaces, she said, “because we’re headed in the wrong direction here.” To have cars sitting in a parking space 98% of the time “doesn’t make sense for society – period,” she said. The transit on State Street will only get better, especially because of the UM athletic campus. But as long as developers provide parking spaces, cars will be parked in them, she said. “We’re putting our aspirations on you,” Bona said. Kirk Westphal agreed, noting that the proposed development doesn’t reach the maximum allowable density for this parcel. But it meets code and overall is a step in the right direction toward meeting the city’s objectives for State Street, he said. Outcome: With six of the nine commissioners present, the rezoning, site plan and development agreement were approved. Absent were Ken Clein and Eleanore Adenekan, who had left earlier in the meeting, and Jeremy Peters. The project will be forwarded to city council for consideration. 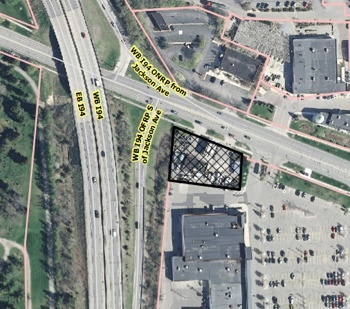 A proposal for a new drive-thru restaurant on Jackson Avenue – near the I-94 interchange – was the last item on the June 17 agenda, and was handled by commissioners near midnight. Aerial view of 2625 Jackson Ave. The restaurant’s single lane drive-thru would primarily be accessed from a proposed curbcut on Jackson Ave., with an exit through the Westgate Shopping Center Jackson Ave. entrance. An existing curbcut off Jackson to the east would be closed. The new curbcut has been approved by the Michigan Dept. of Transportation, and would prevent left turns onto Jackson. The drive-thru lane provides stacking for up to four vehicles and would be screened to the north by the proposed building. In a separate resolution, commissioners were asked to grant a special exception use for this project, which does not require additional city council approval. This is the first drive-thru proposal that’s come through the city’s approval process since the city council approved changes to the Chapter 55 zoning ordinance that regulates drive-thrus. That approval came at the council’s June 2, 2014 meeting. The site is zoned C3 (fringe commercial district), which previously allowed drive-thrus without getting special permission from the planning commission. Now, such projects must meet the revised zoning standards and a special exception use is required. The new standards require that the drive-thru is not located between a public right-of-way and the main building, and that traffic circulation to enter and exit the facility does not interfere with general circulation on the site or with pedestrian circulation on and off the site. No one spoke during the public hearing on this item. Paras Parekh asked about the traffic study, noting that it’s busy in that area. City planner Alexis DiLeo said that staff agreed with the conclusions of the traffic report, which stated that customers would primarily be people who are already driving by the site. The drive-thru isn’t expected to bring new traffic that would cause greater back-ups. And because there would be a connection from the site into the Westgate Shopping Center, circulation is actually expected to improve, she said. Jim Chaconas represented the owners of Westgate Shopping Center. Responding to another query from Parekh, Jim Chaconas – representing Westgate Shopping Center – told commissioners that the drive-thru would likely be either a coffee shop or fast-food restaurant. They’re also talking to AT&T about a possible retail store. Bonnie Bona said it looks like the service entrance for deliveries would be facing the Westgate entrance drive. Chaconas explained that deliveries would likely be made through Westgate Shopping Center – they don’t want delivery trucks going through the site’s driveway. The two tenants will be side-by-side on the site, he said, with both entrances facing the I-94 exit ramp. The back of the building will face the Westgate driveway, but Chaconas said it would be “pretty” so that it doesn’t look like a back door. Regarding the special exception use, Kirk Westphal asked staff if the orientation of this building enhances the pedestrian experience along Jackson. Alexis DiLeo said the building would be close to an existing sidewalk on Jackson, and the project would build a connecting sidewalk from there into the Westgate Shopping Center. The project appears to be convenient for both vehicles and pedestrians, she said. Outcome: Both votes were unanimous for approval, coming shortly after midnight with six of the nine commissioners present. Special exception use approval requires six votes. Eleanore Adenekan and Ken Clein had left earlier in the meeting, and Jeremy Peters was absent. Every meeting includes several opportunities for communications from planning staff and commissioners. No one spoke during the two opportunities for general public commentary. Here are other highlights from June 17. Sabra Briere, the city council’s representative on the planning commission, gave an update on planning-related action taken at the council’s June 16, 2014 meeting. She noted that the council had taken an initial vote to rezone 425 S. Main – a parcel between William and Packard – from D1 to D2. It will require a final vote at a later meeting. In a related vote, the council gave initial approval to a change in the Main Street character overlay district, where 425 S. Main is located. One major amendment was made on the floor, she noted. The planning commission’s had recommended a 100-foot height limit for D2 parcels in the Main Street character overlay district, but council amended it to 60 feet. City planning manager Wendy Rampson. The city staff has been asked to work on revising this change to the character overlay district to reflect the lower building height. Briere said her understanding is that the council doesn’t intend to take up these items for a final vote until the beginning of September. Saying she’d watched the council meeting, Diane Giannola said that clearly most of the councilmembers didn’t have an understanding of floor-area ratio (FAR) in relation to building mass. It would be nice, she added, if someone could explain to them exactly what the planning commission had intended with its recommendations, including the 100-foot height limit. “I think they overlooked a very good compromise,” she said. Briere replied that it’s her intent to bring Legos to the next council meeting. When others at the meeting laughed, Briere noted that although some people might find it humorous, she has found that Legos are an excellent teaching tool. Giannola pointed out that the council had amended the resolution before councilmembers even considered the 100-foot height limit. So when it comes before council again, the resolution will include the amended height limit of 60 feet – and the public won’t know that the planning commission had recommended an alternative approach, Giannola said. Briere replied: “That’s what an amendment does.” She added that one councilmember has requested a 3-D rendering of all the options, which staff will provide. Present: Eleanore Adenekan, Bonnie Bona, Sabra Briere, Ken Clein, Diane Giannola, Paras Parekh, Kirk Westphal, Wendy Woods. Also: City planning manager Wendy Rampson.